In a large pan, fry the bacon until crisp. Drain all but 1 tablespoon of grease. Drain the bacon on paper towel lined plates. Crumble the bacon. Set aside. Saute the mushrooms, garlic, onion, and celery until just beginning to soften. Add the broth, beans and bacon. Heat through. *I actually used reduced sodium Progresso chicken broth. I made this soup for a quick lunch the other day but it really is enough to serve as dinner, perhaps with a roll or cornbread. 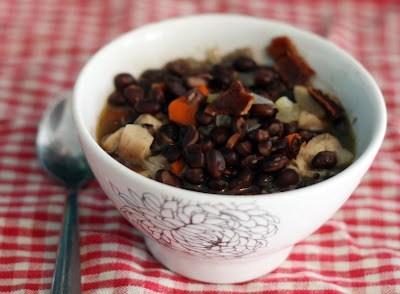 Normally when I made black bean soup I go the spicy route but for a change I used the pepper bacon to add some spice and smoky flavor and kept it pretty simple. The flavors of the vegetables and beans really stand out. I choose oyster mushrooms because they have a meaty texture that holds up well in soup. A good substitute would be portobello but you will miss the oyster-like flavor of the appropriately named oyster mushroom.